Every day it seems, there are so many new beauty products hitting the stores. In an effort to be more selective in my buying habits, I'm going to narrow it down to 5 that I like each week, and then try to research a bit and contemplate about it, before pulling the trigger! Here's a look at the 5 new beauty products that piqued my interest over the past week, and so far, I've only caved and picked up one of them (#4). I don't think #5 is available yet, so that's probably a good thing. 1. Lancôme Olympia's Wonderland Palette, Olympia Le-Tan Collection ($80.00) is a heavy clutch-style palette that I saw on Bloomingdale's site as a "100% Exclusive". It includes a lip base, 4 lip shades, 4 eye shadows, a blush, and a dual-ended lip/eye shadow brush. I found a well-done review on The Happy Sloth's site here, if you'd like to learn more about this palette. 2. Charlotte Tilbury Hollywood Lips Liquid Matte Lipstick ($34.00) is available in 10 shades. I have loved every CT product I've tried, and Show Girl is the shade I'm considering. I do find that many matte liquid type of products tend to look dry on my lips, so I'm going to search some reviews before I order this one. 3. Garnier SkinActive Moisture Bomb Glow-Boosting Sheet Mask ($3.99) is one of five new mask varieties offered by Garnier. I don't use too many face masks during the warmer months, but it looks like something that I would enjoy during the cooler, upcoming months. At buy one get one 40% off at Ulta right now, I think I'll probably order a couple. 4. RMS Beauty Luminizer X Quad ($48.00) features 4 shades of highlighters that can be used individually, blended together, or mixed with other products. I'm a little late to the game with the highlighter craze, but have become somewhat obsessed with them. I ordered this from Bloomingdales, and am anxiously waiting for it to arrive! 5. Claudia Schiffer Make Up (pricing unknown at this time) launches in early September, and based on the photo above, which I saw on Lisa Eldridge's Instagram, I'm going to need a lot of these items! Click here to read more about this collaboration with ArtDeco in an article from The Cut. 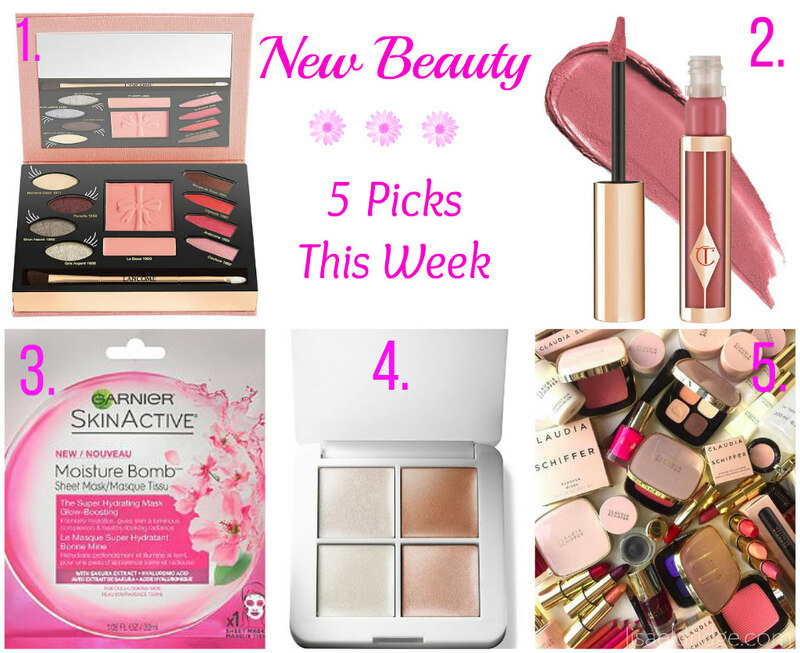 What "new beauty" items are you looking forward to?